Understanding Diffused Aeration Aeration is a vital component in the health of your pond, and it’s important to understand and recognize the benefits. This email will highlight specific key points and how they function to improve the overall ecosystem of your pond and/or lake. Aeration is a vital component in the health of your pond, and it's important to understand and recognize the benefits. This email will highlight specific key points of how aeration functions to improve the overall ecosystem of your pond and/or lake. Organics on the pond bottom begin to breakdown and decompose by bacteria. This decomposition process can occur aerobically (with oxygen) or anaerobically (without oxygen). As long as oxygen is available, it takes place aerobically. The benefit of this is that aerobic decomposition occurs much faster than anaerobic. The negative is that during this process most of the the available dissolved oxygen lessens and may not replenish in a timely manner. Once oxygen is run-down, the decomposition process converts to anaerobic - and without oxygen, fish and other pond inhabitants will begin to die. Mosquitoes thrive in stagnant water. 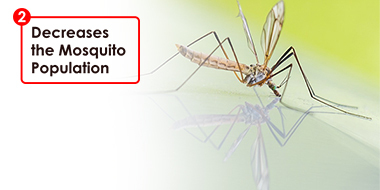 Uncirculated, standing water and small areas of larger ponds are an open invitation to breeding mosquitoes. By incorporating aeration, you increase movement and eliminate the chances of having a biting breeding ground. The thermocline is the border between the surface water and deeper water. The surface being exposed to sunlight more consistently is warmer. The deeper having less exposure to sunlight is colder and generally more stagnant - making the water temperature inconsistent throughout the pond. Aeration helps even out these zones with circulation making the pond more consistent in temperature. Throughout the season your pond accumulates debris - leaves, plant matter, fish waste, etc. This muck and bottom sludge are loaded with nutrients which are a huge food source for algae blooms. Because aeration increases dissolved oxygen and promotes aerobic bacteria, you're accelerating the breakdown of what algae feed on! During the winter, organic debris continues to decompose which releases toxic gasses. If the pond freezes over these gasses have no escape and reduce the available oxygen for your fish. If enough oxygen is loss your fish can die. Using aeration provides water movement towards the surface helping to maintain a small opening in the ice. For any additional questions, please don't hesitate to contact us at (866) 819-7663.